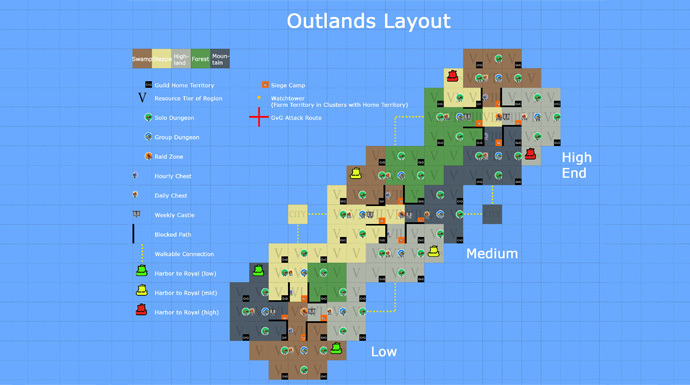 We are reworking the Outlands, find out all you need to know here! 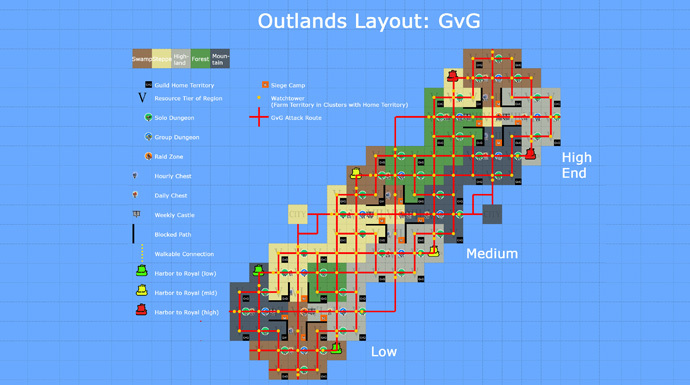 One of the main aspects that we will be working on to get the game ready for release is the new Outlands. 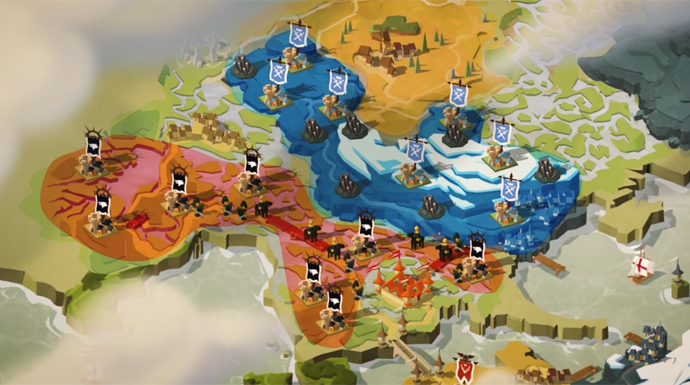 These are the areas of Albion Online where PvP is totally unrestricted. They are optimized for guild play. Here, guilds are able to capture their own plots of land, build up their own towns and fight over control, influence, power and wealth in the region. They also contain player cities that act as a good base for players and, via guild islands, allow guilds to take part in the outland gameplay who are not yet ready to capture their own home territory. When redesigning the Outlands, we are making use of lessons learned from the Beta 1 and the Final Beta, with the goal of combining each version strengths while avoiding the weaknesses. By increasing the ratio of home territories versus normal territories, we want to achieve a higher population density. At the same time, we will still make sure that home territories will always have one buffer zone in between them. The outside areas of the Outlands will be lower risk and lower reward, and will be tailored more towards solo and small scale play. The central areas are expected to see constant group action. The top right region offers the highest rewards in terms of resources and PvE content, and we expect it to be the most competitive and most densely populated. The bottom left region is at the lowest end. Since they offer lower rewards, we expect that area to be more peaceful, less competitive and also less densely populated. By deciding where they want to settle, guilds can pick their own level of difficulty. For the lower end zones, we will try out our soft gear cap mechanics that we successfully used in Beta 1. In the current Outlands, the travel distance from a home territory to the next harbor could be up to 12 zones, and up to 8 zones to the next city. The travel distances are being reduced, without making them too small. 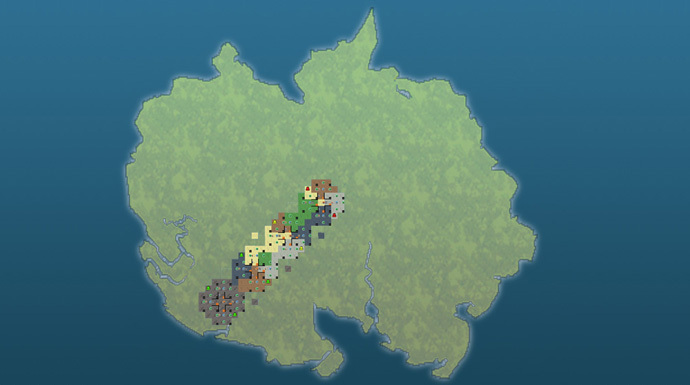 Furthermore, the higher end Outlands will have a longer effective travel distance to the green zones than the lower end Outlands in order to encourage trading. Note that in the picture above, the green harbors lead to places at the start of the yellow/red zones, the yellow harbours lead to the middle of the red zone and the red harbours to the outer reaches of the red zone. In the current Outlands, the top end guilds could not really fight each other if they were in different time zones, as the distance between them was too large. Instead they had to fight their neighbors, which usually did not stand a chance. The new layout makes sure that guilds of similar skill can settle next to each other and compete, no matter their peak time zone. As shown in the picture below, the Outlands layout can be expanded dynamically to account for a growing population post release. We want Albion Online's world to feel real and immersive. Apart from the actual zone design, this has a lot to do with how zones are presented on the world map. We will rework the current world map, with the goal to create a more realistic look and feel. As an illustration of what we mean by this, please see the picture below, but note that the actual look and feel is still under development. We are very confident that the new Outlands design fulfills all the above design goals and is a drastic improvement on the current layout, but also on the layout used in Beta 1. We are looking forward to your questions and feedback. Let us know what you think on our forums!